Dollywagon lies to the left and Nethermost, right. Ruthwaite Lodge can (just) be seen, as a white speck, down in the Grisedale valley to the left of the joining of the tributaries of Ruthwaite Beck. The path can be seen rising to it close to the beck in the bottom right of the picture. 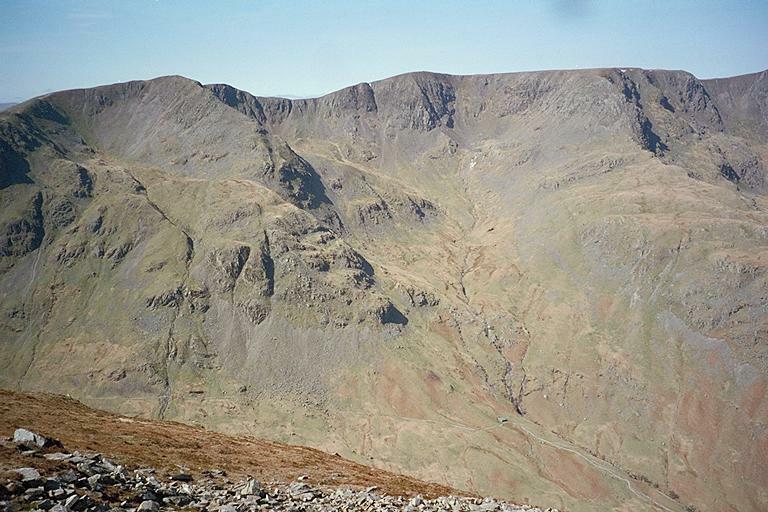 The route to the east ridge of Dollywagon lies to the right of Spout Crag - prominent above and to the left of the Lodge it is not high but is impassable for the walker - and the ridge can be gained either just above Spout Crag or further up at the start of The Tongue - the higher part of the ridge. Smaller version of this picture.